Was there ever a golden age for Italian museums? The complaints made by Italian curators and art historians about funding shortages, bureaucratic travails and the failure to incentivise philanthropic activity are longstanding. On the broader plain of cultural heritage, the international press has regularly drawn attention to the vulnerability of many important sites – including Pompeii, where flooding has caused further collapses this spring, and L’Aquila, still undergoing haphazard reconstruction after the 2009 earthquake. But from a museum visitor’s perspective, it remains alarming to encounter firsthand situations where backstage difficulties have had a palpable effect on major institutions: in fraying buildings, a lack of gallery staff, a lack of fellow visitors, withered exhibition programmes, and temporary closures. Such things have a tendency to take over any visit: once you start to spot them, you can’t help seeking out more. For all the artistic richness of Naples, that was my experience on a recent trip to the city. In the mosaic galleries of the Museo Archeologico Nazionale, a section of the floor had buckled upwards and was cordoned off like a small parody of an archaeological site. Throughout the museum, items on loan were marked with laminated A4 sheets on empty plinths, or with stickers peeling from the wall. 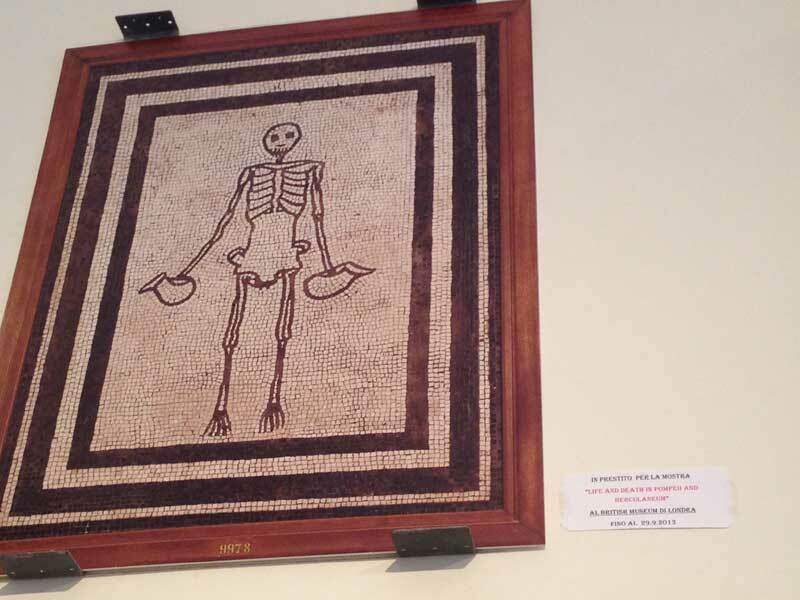 In the last week of February 2014, the famous skeleton mosaic from Pompeii was missing in action. A sticker insisted that it was on loan to the British Museum, due back at the end of September 2013. At the Museo di Capodimonte, where the galleries themselves are so well appointed, apprehensions about security swiftly detracted from my esteem for the display. The Farnese Gallery and the suite of rooms dedicated to Neapolitan painting were ostensibly overseen by just two room attendants each. Four people seemed tasked with guarding more than 50 rooms between them. The museum may have been uncannily quiet on a weekday afternoon, but when a party of schoolchildren bustled through, there was nobody to intervene as they jostled in front of the Titians, swigging from cans of Coke. And then, in both museums, there is the sad frustration of finding entire sections closed off to the public. Even if one has been warned to expect this, it doesn’t make the fact any less disappointing. Empty coffers have transformed grand enfilades into dead ends. At Capodimonte, there was no access to the collection of 17th-century Neapolitan painting – no Ribera, no Luca Giordano, no Mattia Preti. At the Museo Archeologico, the Villa dei Papiri had been locked up for the afternoon. April’s issue of Apollo features ‘Le Trésor de Naples’ (until 20 July), an exhibition at the Musée Maillol in Paris that sees items from the remarkable hoard of votive offerings dedicated to San Gennaro, the city’s foremost patron saint, leave Italy for the first time. It is a major coup for the organisers to have arranged these loans: the objects play such an central part in the lore of Naples and its visitor economy that both the Museo del Tesoro itself and the associated soprintendenza must have taken some persuasion. The Palazzo Sciarra in Rome presented a version of this exhibition over the winter under the auspices of the privately run Fondazione Roma. If the budgetary stranglehold continues in Italy, as it looks set to, it will be interesting to see how far such foundations can go to sustain the cultural life of the country, and what else such collaborations are able to achieve. Perhaps Naples needs the equivalent of the Fondazione Palazzo Strozzi in Florence, a strong public-private model that encourages best practice and optimism about cultural renewal. More widely, international loan exhibitions from Italy – especially those as notable as ‘Le Trésor de Naples’ – must open up debate about both shortfalls and shortcomings in the country’s public museums. And this does not mean merely drawing contrasts between museum cultures – one upshot of ‘Life and Death in Pompeii and Herculaneum’ at the British Museum last year. It means conversation, pragmatism, and actively seeking solutions.